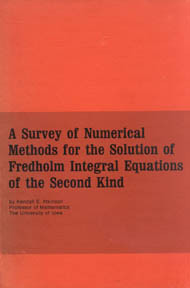 A Survey of Numerical Methods for the Solution of Fredholm Integral Equations of the Second Kind. This is a research monograph, and it was published by SIAM in 1976. It is now out-of-print, although probably still available from a variety of used book websites. An Introduction to Numerical Analysis, 2nd edition, John Wiley & Sons, Inc, 1989. More detail on this book can be obtained from the publisher by going to John Wiley & Sons and doing a search on my name Kendall Atkinson. For errors known to remain as of printing #12 of the book, click here; these are to be corrected in a future printing of the book. For a complete list of all errors from the first printing onward, click here; most corrections were made within the first few printings. There is an instructor's manual for only the first edition of this text, although it covers around 75% of the problems in the second edition. Course materials are also available from my teaching of a two-semester class using the book: see Chapters 1-5 and Chapters 6-9. Elementary Numerical Analysis, 3rd edition (co-authored with Professor Weimin Han), John Wiley & Sons, Inc, 2003. The publisher's page on the book, click here. There is a solution's manual for this text. Additional course materials are also available for the book, including overhead slides, Matlab programs, and Matlab GUIs. We have a list of errors in the first printing of the text. This will be updated as additional errors are found. A Chinese language edition appeared in 2009; click here. The Numerical Solution of Integral Equations of the Second Kind, Cambridge University Press, 1997. You can view files from the book manuscript for both the complete table of contents (ps or pdf) and the bibliography (ps or pdf). The latter has been updated slightly in the final published version. Theoretical Numerical Analysis: A Functional Analysis Framework, 3rd edition (Co-authored with Professor Weimin Han), Springer-Verlag, 2009. (Table of contents) For the errors in the 1st edition, click here. For errors in the 2nd edition, click here. For the errors in the 3rd edition, click here. These lists will be updated as additional errors are found. The Numerical Solution of Ordinary Differential Equations (Co-authored with Professor Weimin Han and Professor David Stewart), John Wiley and Sons, 2009. Programs given in the book are also available from here. 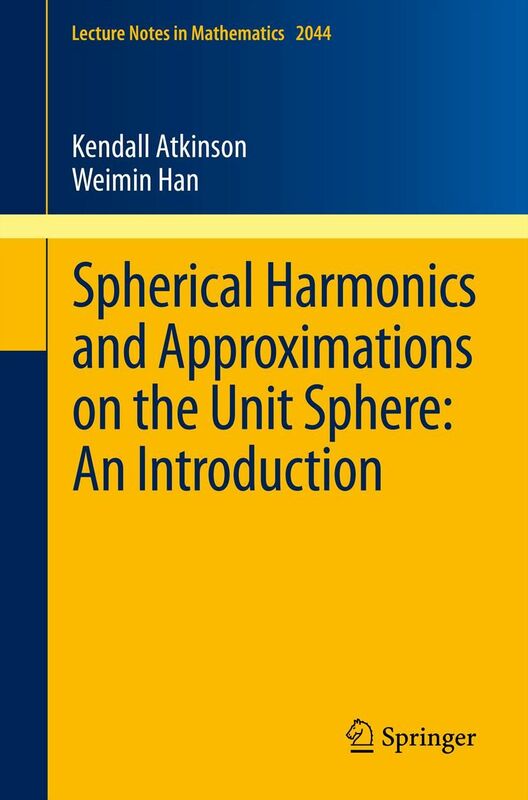 Spherical Harmonics and Approximations on the Unit Sphere: An Introduction (Co-authored with Professor Weimin Han), Springer-Verlag, 2012. For corrections and changes, click here. This list will be updated as additional errors are found.